Those of you who have been gluten-free for any length of time, think back to when you first went gluten-free. How many people had even heard about gluten/celiac disease/Non Celiac Gluten Sensitivity/gluten-related disorders? Right, not very many. Fast forward to today, we're seeing gluten-free everywhere. So much in fact that it's being called *gasp* "a fad diet". We, the gluten-free community have been wanting mainstream recognition for a long time. It may not be in the exact form we were hoping for, but GF is now mainstream! Mintel, a global market research firm predicts retail sales of GF foods and beverages to reach $10.5 billion this year and will grow to $15.6 billion by 2016. They also revealed that 75% of consumers [without CD or NCGS] ate gluten-free foods because they thought the foods were healthier. Some 24% of consumers eat or have someone in their household who eats gluten-free foods. It's very clear this market is not being driven only by those with celiac/gluten-sensitivity. It's also clear that many people are misinformed and some are probably eating gluten-free for all the “wrong” reasons. Most certainly some confusion is being generated by the “gluten-free dabblers” [those that are experimenting]. Yes, there is a bit of turbulence, but we need to control it best we can and ride it out. The current environment may not be optimal, but I think we are seeing “growing pains” as our society comes to grip with gluten and its effects. Things are in a state of flux right now. The packaged food industry, hospitality industry, food service professionals, health care professionals are all trying to figure out how to deal with the gluten-free phenomenon. We know all too well that some are doing better than others at navigating the uncharted gluten-free waters. As the researchers keep digging, they keep finding more evidence of harm that gluten is inflicting. Americans have shorter life spans and more illnesses than other comparable high-income countries. It's no secret that on average, we are an unhealthy nation. People are sick and tired of feeling sick and tired so they seek out solutions. Some are willing to take matters into their own hands because many of the medical professionals have some catching up to do when it comes to gluten-related disorders. pro-cess: a series of actions or steps taken in order to achieve a particular end. Let's take a look at this situation in a different way. 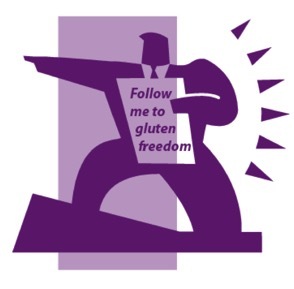 I think we can all agree that the path to gluten-freedom is a process. We didn't wake up one morning with this all-encompassing knowledge about gluten-free. It took time for us to build our knowledge base. We all had a starting point; we all took our wobbly first steps. What if this is a dabbler's first step in their journey? After my biopsies came back negative, I decided to do dietary trials, I went off and on gluten several times over three or four months in order to figure out what was going on. Yup, I was a “GF dabbler”. However, once I figured out gluten was an issue for me, it was hasta la vista, baby! It's been over 10 years since gluten has intentionally touched my lips. Even though people may be misinformed or have a misunderstanding as to why they are trying gluten-free, they may unexpectedly realize relief from other physical ailments. They might have a “light bulb” moment that could be life-altering for them, their children and future generations of their family. As frustrating as some of our encounters may be, perhaps being supportive is the best role for us to play. While we may never fully understand or know the true intent of those seeking answers by experimentation, don't they deserve the benefit of the doubt? If I hadn't received support before, during and after my trials, things might have turned out differently. What if we are the only supportive people they encounter while doing this? Those of us that live this 24/7/365 are the ambassadors of the gluten-free lifestyle. It is our responsibility to educate the masses. If not us – who will? For certain this is a Herculean task, but at least it's easier than herding cats. There are leaders and those who lead. Leaders typically hold a position of power or authority. Those who lead have the ability to inspire without power or authority. We only need to look to Mahatma Gandhi, Martin Luther King, Jr. and Nelson Mandela as perfect examples of those who lead. We may not possess that amount of fame, but that's the beauty of "those who lead" - we don't need it. Each one of us can inspire others simply by leading by example. We chose not to be a victim; not to give up and say "I can't do this gluten-free thing, it's too hard". We chose to be successful. Every time we opt out from an opportunity to cheat, we show others that we take our health and lifestyle seriously. Indeed our actions can speak louder than words. Every day we can find gluten free teachable moments, they're all around us. A simple and polite "No thank you, I am gluten-zero because the gluten in those donuts make me sick" when the quickie-mart employee asks if we want 3-for-a-dollar donuts as we pay for gasoline. How about a respectful interchange of facts with those that are "gluten-free most of the time". Better yet, invite them to a local support group meeting, so they can really learn what gluten-free is all about. Sharing educational information with your health care team members [doctor, dentist, pharmacist, etc]. Speaking to food service professionals about gluten-free dining options [or lack there of]. Bringing a plate of your killer peanut butter cookies to [anonymously] share at work; specially for that co-worker who turns up their nose at your "icky gluten-free food". Of course, you don't tell anyone they are gluten-free until Mr/Mrs Food Snob proclaims them as "The Best!". Ah sweet justice. Gluten-free awareness is continuing to grow, but we need everyone's help. In order to raise awareness properly, everyone in the gluten-free community must keep educating, motivating and advocating.